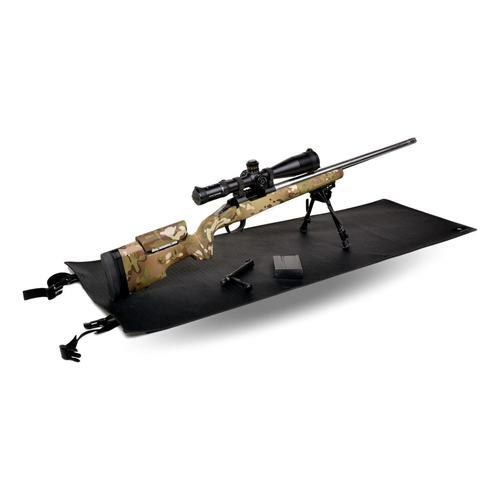 The Crosstac Rifle Maintenance Mat gives you a clean, useful space to work on your firearms no matter where you happen to be and has built-in, smarter features that help make cleaning a breeze. The diamond plate grippy rubberized work surface is totally oil and solvent proof. We call it the “marriage saver” around here. Why? Because spilling a bottle of solvent all over the kitchen table usually doesn’t end well, unless you have our Rifle Maintenance Mat ! We include all the attention to detail Crosstac is known for, such as 4 embedded magnets in the mat to keep small parts like scope screws, trigger pins, and springs from getting lost. The mat rolls up into the size of a newspaper and unrolls to give you the ultimate platform for working on your long guns. Another industry first from the shooters at Crosstac!